I've been thinking a lot about TIME lately. How little I seem to have in a day (or left in my life) and how fast it's flying by. 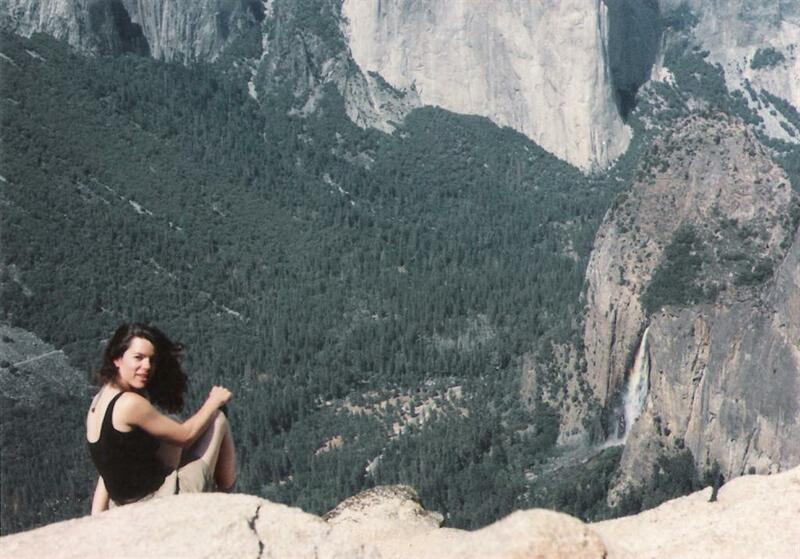 This is picture of me when I lived and worked in Yosemite, around 20 years ago. That sounds so surreal to say! The concept of that much time eludes me, I can't seem to grasp the enormity or the brevity of it. So much has happened since then, yet could be considered merely a blip when I look back on it in my 90s. I can only hope to live that long, but life has a way of randomly being cut short when you least expect it. There is no way to know how much time I have left, all I know is how vital every second of it feels to me right now. I have become obsessed with how I spend my time, who I spend it with and what I spend it on. A guy I know recently celebrated his birthday and in his invite to friends to help him celebrate, he wrote that what he cherished most in life was his time, whether it was spent being a hermit or hanging with friends or making art and/or love, if he had ever kicked it with you remember that he gave you the most valuable part of himself, cuz he couldn't get that time back to use somewhere else. This made his offer of spending time with him seem incredibly special and struck me how time in itself can be a meaningful gift. A lot of my friends are now attending their 20 and 30 year high school reunions. An obscure mark of time to me, but an inevitable rite of passage into middle age it seems. I was not invited to a reunion, since I dropped out of high school and took a completely different path. Instead of going on to college and developing a career, I chose to go into the mountains and develop the art of experience. Living in Yosemite was like waking up to the most beautiful painting everyday, and every time you blinked it would become more beautiful in new and different ways. That painting pulled me in and I became a part of it and in turn, it will always be a part of me. It was the richest gift I could give myself and time well spent (9 years!). Every minute of everyday, I am making decisions based on my priorities. Tricky part is that those priorities have a way of shifting around on me! Earlier this year, I put art on hold to try something completely different. It was an incredibly rewarding lesson for me to attempt to organize an event of that magnitude -and pull it off. Someday I will get around to blogging about it! The most valuable thing I gained from it all was the relationships I formed and strengthened with other parent volunteers and artists through the experience. I lost my art for a while, but I gained a lot of love. When it comes right down to it, Love really is what matters most to me. Time well spent is a form of love: loving your life. What an amazing picture as well as insight...Thanks for sharing.